Slaking in game: 476 Who? Important notice! Pokemon Slaking is a fictional character of humans. 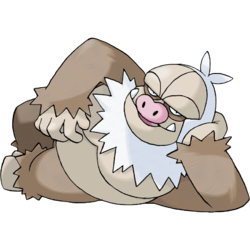 Slaking made its debut appearance in Love, Petalburg Style, belonging to May's father, Norman, the Gym Leader of Petalburg City. In the following episode, Ash's Grovyle defeated it in battle, winning Ash the Balance Badge. Slaking appeared again in Strategy With a Smile! watching the Wallace Cup on television with Norman. 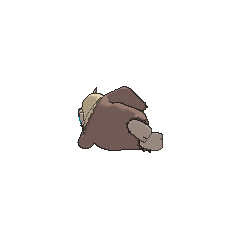 Sawyer has a Slaking which first appeared in Valuable Experience for All!. A Slaking appeared in the opening of Destiny Deoxys. A Slaking appeared as a mask for the festival in Capacia Island UFO!. A Slaking appeared in The Journalist from Another Region!, as Ash's Pignite's second opponent in the Pokémon Sumo Tournament, where it lost due to not even trying. 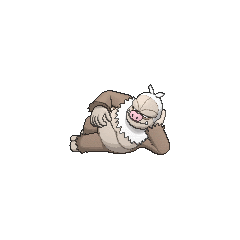 Norman's signature Pokémon is a Slaking, just as in the games. Although it would seem that its Ability would be of major hindrance, he shows that by having a Spinda tag alongside it and use Skill Swap in times of need, its impressive strength and speed would be wielded to their maximum. Additionally, the move Bulk Up allows it to bolster its stats even more. Emerald used a Slaking during his Battle Factory challenge. Thanks to Slack Off, it was able to outlast a Hitmonlee despite its type and speed disadvantages. After the battle, it was swapped with a Linoone. Palace Maven Spenser also used a Slaking against the young boy, but their battle was not seen. 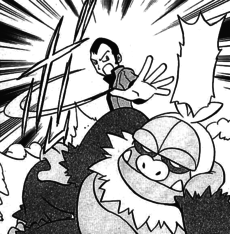 Slaking has several similarities to Regigigas. They are both Normal types, have hindering abilities (Truant and Slow Start), have the highest Attack base stat out of all Normal-type Pokémon, and have the same base stat totals. Outside of Legendary and Mythical Pokémon and Mega Evolution, Slaking has the highest base stat total of all Pokémon.